This was a very interactive and an excellent training. We were given the overall background on Agile and Scrum with all the necessary tips and tricks to pass the certification exam. Pavel Dabrytski has a great wealth of knowledge in this area and he was very good at relaying it to the students. I would recommend this course to anyone interested in getting a solid understanding of Scrum and passing the CSM exam. The commercial, cultural and educational capital of East India - Kolkata, ranks third in metropolitan populace and productivity. Primarily operating through its port and an international airport which hastens transportation while reducing geographical barriers between countries, the city has lots to boast. Several national and internationally acclaimed universities aim at producing highly skilled work force. With all this in place, Kolkata provides immense opportunity, resources and platform for software and IT personnel with expertise in Agile Management and Certified Scrum Developer Certification. KnowledgeHut provides CSD training in Kolkata also called as the Certified Scrum Developer Certification in Kolkata. Majorly meant to assist IT & software employees, along with software engineers, testers and coders, the course brings to the table a sound understanding of the Scrum principles and Agile engineering concepts. What is the course all about? Scrum Development is an Agile Management programme that helps programmers and testers simplify the process of developing complicated programmes by employing Scrum tools and Agile Management principles. Upon the completion of the course, professionals can enjoy an edge over their peers while improving workplace relationships. Making use of the exhaustive course material, a strong foundation of basics is guaranteed by a demo, along with interesting lectures and workshops, conducted by an eminent tutor affiliated to KnowlegeHut. Benefits of the Course: Growth and demand for professionals linked to the scrum environment through the CSD Certification in Kolkata is very high due to the fact that this training simplifies complicated product development effortlessly. 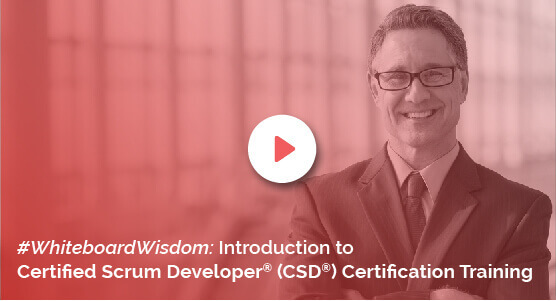 Once you are certified as a CSD professional, you can proudly connect with others through a profile page on the Scrum Alliance website that comes with a specially designed logo validating your credentials. The KnowledgeHut Way: The online Certified Scrum Developer training in Kolkata at KnowlegeHut is provided by certified agile management trainers associated with this top academy at a nominal cost. The engineering and IT professionals at Kolkata can effortlessly enrol and pay fees for the Certified ScrumDeveloper certification of KnowledgeHut without any hassles.